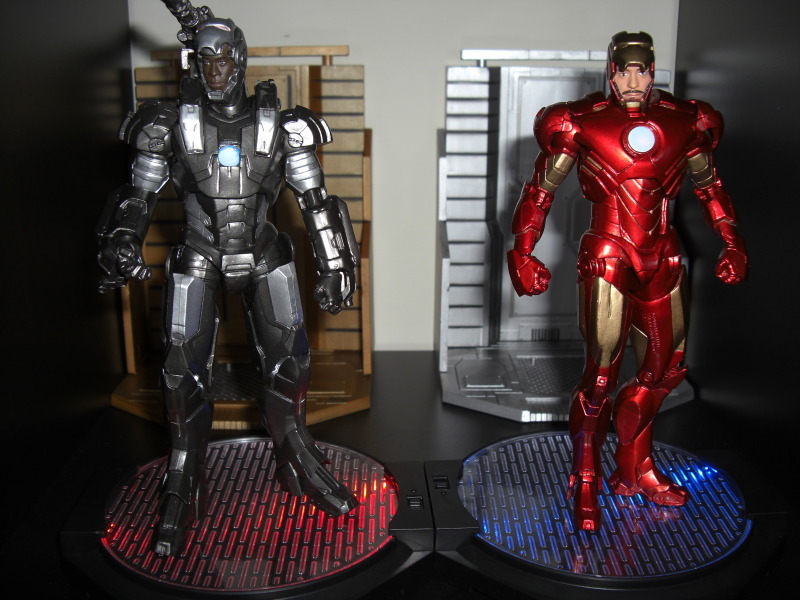 2005 boards member Squall42080 has snapped shots of his recently acquired War Machine figure from the 7″ Iron Man 2 line by Marvel Select. 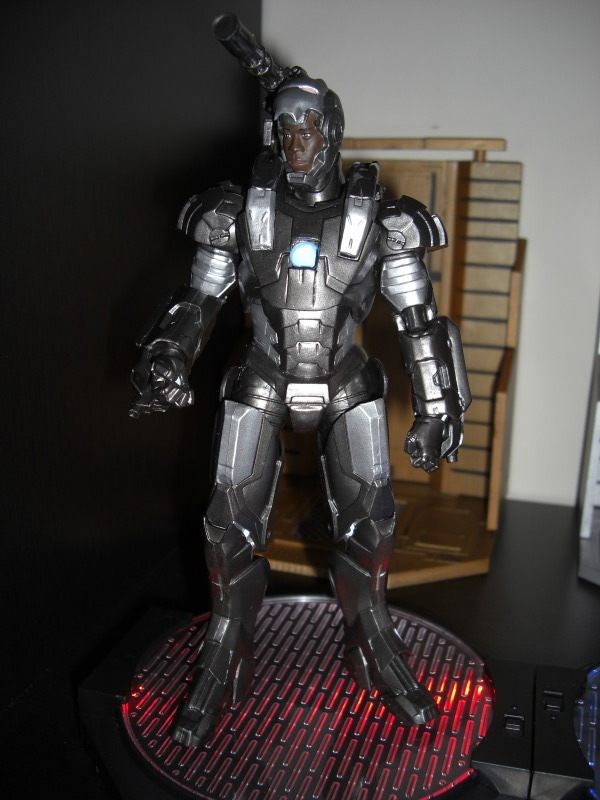 The figure in question is the unmasked variant based on the likeness of Don Cheadle which is exclusive to Borders. This figure was released very recently and should hit wider distribution soon. 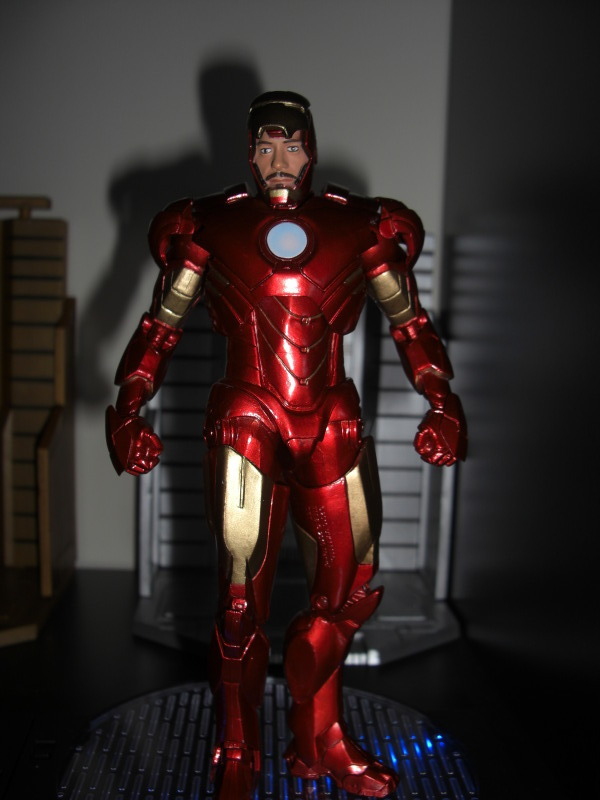 Also shown is the exclusive unmasked Iron Man Mark IV, click on the title bar to see the new images! so the unmasked part is a varient and not a feature on the figure. Where did you get those cool light-up display bases? The unmasked feature is only available on the variant, which is exclusive to Borders. 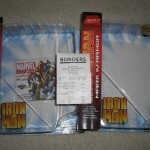 The regular releases at comic shops won't have the removable faceplate. Yes you have the option. Tony's armor seems too chunky; I need to see these with their masks down compared to the normal releases to judge which I might get. 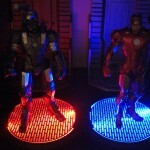 also wondering about the light-up bases? 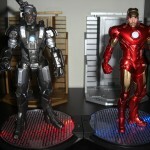 They're made by Bandai for Gundam kits, I believe, The Iron Man figures do not come with those. That's why I'm opting for the Wal-Mart exclusive. Extra hands, slimmer, colors match, and I can pretend he's not Don Cheadle. lol Terrence was a way better Rhodey, IMO. Terrence was a way better Rhodey, IMO. It's too bad he didn't want to come back, he turned it down. He messed up, I didn't know that though. War Machine's gonna be the surprise moneymaker of the movie and toyline I think. They're figure stands for Gundams I think. You can get them at various sites that sell them. And these look awesome. 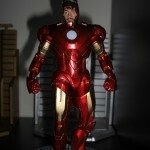 I definitely need the Iron Man. Not so sure about War Machine though. I just can't get enough RDJ. I don't even think Terrence looks like Rhodey. Either way, both actors are too mellow to play Rhodey. Especially recently, Rhodes has not been the happiest camper. He was always cool, but not a soft-spoken dude. But I want both! This one is 1" taller! This is going to be a tough one. 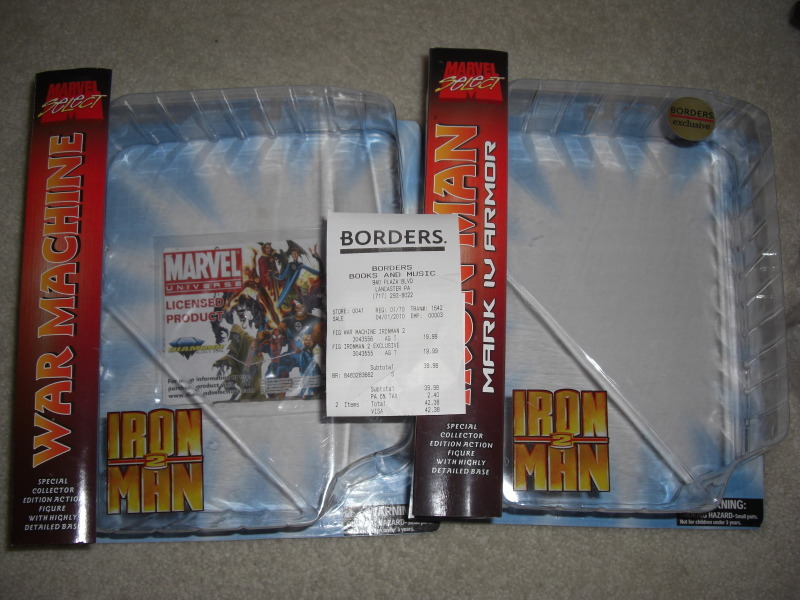 Removable mask versions are Border's exclusives, the regular versions are non-exclusive. 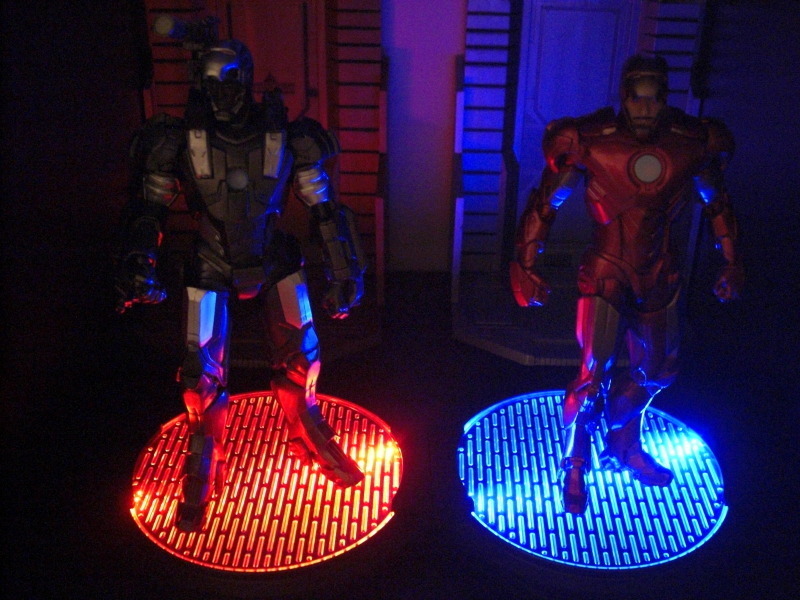 The light up bases shown are from another toyline. It is removable, there are 2 pegs on top of the head, and 2 in the forehead for plugging the mask in for closed or open positions. The bad thing is, no matter what position, there will still be 2 exposed holes on the head. Initially I heard he was shocked that he was not picked and wanted to come back. War Machine's gonna be the surprise moneymaker of the movie and toyline I think. 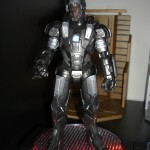 I agree, people have been wanting to see War Machine since the 1st movie and the toys of him so far are GREAT. I want both as well, they serve different purposes for me. The 6" one will be my go-to for playing/posing. The Marvel Select one I will play and pose but it is the better of the 2 to display, the sculpt is awesome and the articulation is decent, albeit disappointing on the hips. Terrence would "whoop that trick" though. Don won't sling no raps outta that suit. The removable mask is the only thing that wins over the Wal-mart War Machine. And since I can live without the removable mask the WM version will be the one I eventually pick up. The bad thing about the unmasked versions is that the holes on the head(2 of which are visible no matter what) deter from the look. Got a rewards coupon from Borders today for buy 1, get 1 50% off. I called my nearest store, and they said they just received this War Machine. I think I may go pick it up along with Iron Man. Like Shin said, just the head will be different. Borders is the only one getting the removable mask/Cheadle head sculpt. Other places, such as Comic book stores, that get this in will have a regular head, but otherwise identical figure.